AUDUSD is under the influence of possible Brexit and Yellen’s speech regarding the economic condition in the US. The pair has been moving with bullish bias within the ascendant channel. 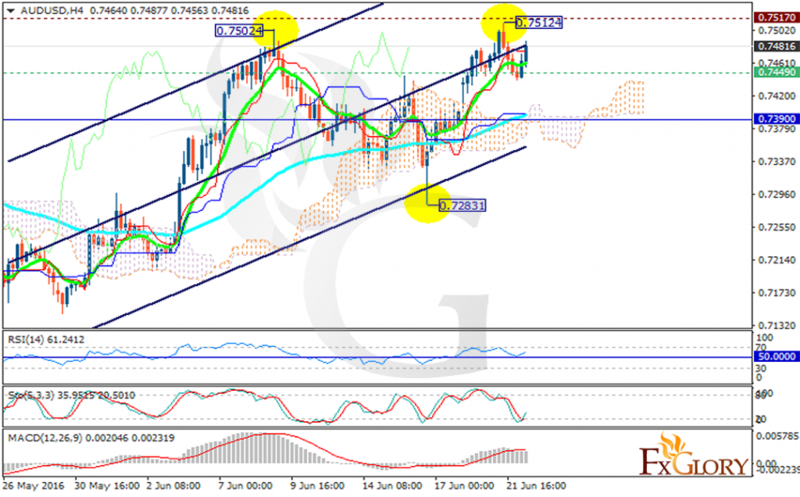 The support rests at 0.74490 with resistance at 0.75170 which both lines are above the weekly pivot point at 0.73900. The EMA of 10 is rising as well and is moving above the EMA of 75. The price is above the Ichimoku Cloud and it is above the Chinkou Span. The Tenkan-sen and the Kijun-sen are showing horizontal trend. The RSI is rising towards the overbought line, the MACD indicator is in positive territory and the Stochastic is showing upward momentum. Long positions are recommended with the target at the previous high at 0.75120.